As this is our first entry and we love the idea of starting this blog with a tutorial entry. What would be best way to interact with our readers, but with hands on action. A couple of days ago, I happen to chance upon these pretty yummy looking spoons on Pinterest and it led me to Delicious Delicious Delicious where I got these photos from. These party spoons are great as party favors or to be served on your desert table for guests to enjoy. Not only do they look good, they are pretty easy to make too. You can get these spoons from Daiso. It would get you about a pack of 8 (for just $2), or you could get other colored spoons to have them fit your party theme. Next, you will need to melt the chocolate, either in the microwave, or over some simmering water. Level your spoons (you can use anything like a magazine or the edge of a chopping board under the handles of the spoons), then pour the liquid chocolate in so that it doesn’t spill. 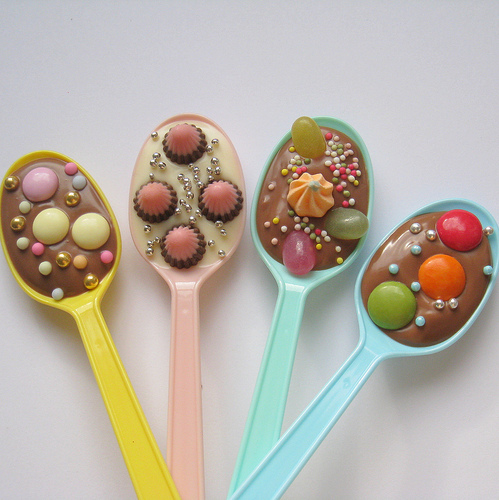 Let the liquid chocolate cool for a bit (about 10 mins), then go mad with decorating the spoons with your colored candies, and sprinkles. This is to prevent your colorful decorations from melting on the molten chocolate. ← New and Coming Soon.